WELCOME & GREETINGS! We are accepting NEW STUDENTS for Summer and FALL 2018! Tuition and/or fees are due by the 1st day of each month by cash, check, or charge. Tuition and/or fee payments made after the 7th day of the month will be assessed a $10 late fee without exception. Post-dated checks are not an acceptable form of payment. Returned checks will be assessed a $35 returned check fee. 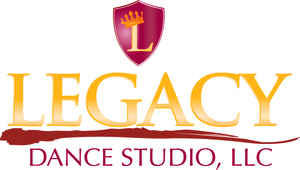 Checks should be made payable to Legacy Dance Studio LLC. Tuition is due from the 1st day of September through May 1st. Tuition for the months of May and June are due May 1st. Monthly and Annual Tuition, once paid, is non-refundable and non-transferable. Tuition must be current to attend class, participate in any performances, and receive recital tickets or costumes. Students with tuition balances past-due 1 month will not be allowed to take class until tuition and fees are current. In addition to the first month's tuition, a non-refundable annual fee of $25 per family is required at registration. Registration Fee does not cover admission to recital nor any parent tickets for the recital. A student may withdraw for any reason, but because of fixed overhead expenses, one month advance written notice must be given. Written notice must be dated and delivered to the Owner or the receptionist on duty. Withdrawing students are responsible for tuition during the one-month withdrawal period. Tuition must be current in order for costumes to be released. Students who withdraw from the school year before the end of the season WILL NOT RECEIVE A COSTUME unless the full 10 months of tuition has been paid. If enrolled in auto-pay, costumes and other fees will not be automatically deducted with tuition. You are responsible for initiating costume payments through the family portal. Or, submit written permission for Legacy Dance Studio to deduct payment. Send written permission to LegacyTuition@gmail.com. Tuition is due by the first of each month. If accounts are paid after the seventh of the month, there will be a $10.00 late fee applied to the account balance. There is a $35.00 returned check charge for any checks returned by the bank. The undersigned gives permission to Legacy Dance Studio, its owners and operators to seek medical treatment for the participant in the event they are not able to reach a parent or guardian. I hereby declare any physical/mental problems, restrictions, or condition and/or declare the participant to be in good physical and mental health. I request that our doctor/physician be called and that my child be transported to the hospital. I hereby grant permission to LDS to photograph or videotape me/my child(ren) and to use photographs or videotapes of me/my child(ren) on LDS web sites or other electronic form or media, and to offer the photographs for use or distribution without notifying me. I hereby waive any right to inspect or approve the photographs or electronic matter that may be used in conjunction with them now or in the future, whether that use is known to me or unknown, and I waive any right to royalties or other compensation arising from or related to the use of the photographs and/or videos. As the legal parent or guardian, I hereby assume full responsibility for any and all damages, injuries, or losses that I/my child(ren) may sustain or incur in anyway while attending or participating in any LDS class or activity. I hereby waive any and all claims against the staff, owner/operators, their spouses, individually or otherwise, of LDS, for any injuries I/my child(ren) may sustain while attending or participating in any LDS class or activity. I fully understand that any medical treatment given to me/my child(ren) will be for first aid only and that this form can be photocopied for emergency treatment. For and in consideration of the acceptance of me/my child(ren) in any LDS class or activity, I/we hereby release, forever discharge, and agree to hold harmless LDS from and against any claims, damages, injuries, or liability arising from or relating to my/my child(ren)'s participation in any LDS class or activity, and the use of photographs or videotapes of me/my child(ren), including but not limited to any re-use, distortion, blurring, alteration, optical illusion or use in composite form, either intentionally or otherwise, that may occur or be produced in production of the finished product. I have read this release and I fully understand the contents, meaning and impact of this release.